Now that the final Super Bowl touchdown has been scored, the dip bowl wiped clean and the last of the chicken wings devoured, we’re taking a look at some game-day search trends to see what football fans were searching for this year. As the Giants and Patriots battled it out on the field yesterday, U.S. viewers multi-tasked, watching the game on television and also going online more than ever before, turning to their smartphones and tablets to look up players, halftime show performers and their favorite Super Bowl commercials. In fact, around 41% of searches related to [Super Bowl ads] that were made during the game came from mobile devices, up from 25% for the same time the day prior. This was the first year that the Super Bowl was live streamed, and there was a significant spike in searches related to Super Bowl live streaming on game day. Searches peaked at kickoff, and were made predominantly on desktop, followed by mobile phones and then tablets. Searches for the Spanish language version of the live stream made the list of top trending queries, and while it may have have been after midnight on the other side of the Atlantic, we still saw searches for [Super Bowl 2012 übertragung] and [w9 streaming] in Germany and France, respectively. The Giants claimed the game in a down-to-the-wire nail biter; however, the Patriots edged them out in searches. Patriots quarterback Tom Brady not only broke Joe Montana’s record for the most touchdown passes at a Super Bowl, he also scored the most searches out of all the players. 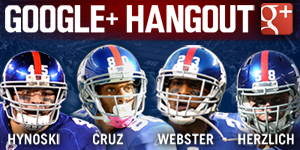 Eli Manning, Victor Cruz, Aaron Hernandez and Danny Woodhead rounded out the top five players trending during the game. The Material Girl Madonna took the honor of being the most-searched for term during the game, but other celebrities that caught viewers’ eyes included Super Bowl performers LMFAO, Kelly Clarkson and Nicki Minaj. Searches for Katherine McPhee’s soon-to-premiere NBC show [Smash] beat out searches for David Beckham’s H&M ad campaign. Finally, no Super Bowl wrap-up would be complete without talking about the commercials. 2012 saw a pre-Super Bowl ad bonanza, with many of the top commercials either being teased or posted in full well in advance of the game. Super Bowl ads or ad teasers were watched more than 30 million times on YouTube before the big weekend this year (you can read more on the top rising Super Bowl searches on YouTube here). 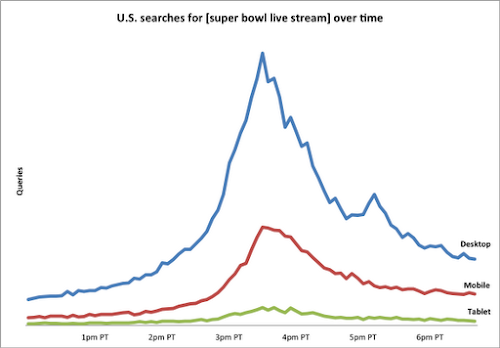 Game day searches for [super bowl ads] were 122 times higher than the same time last week. The most popular commercials in terms of Google searches were ads from Acura, GoDaddy and M&M’s. Searches for The Avengers movie trailer were also trending, along with Chrysler’s spot featuring Clint Eastwood. Now that you’ve seen them all, vote for your favorite commercial of the game on the YouTube Ad Blitz channel. The winning ads will be showcased on the YouTube homepage on February 18. To download the full infographic above, visit Think Insights, our website for marketers. Our final Ad Blitz infographic (coming soon) will include new facts and stats about Super Bowl ads, and you can follow Think with Google on Google+ to be the first to know when it’s released. It wouldn’t be the Super Bowl without the commercials. We’ve already seen a flurry of pre-game teasers pop up on YouTube and Google+, but which commercial will reign supreme? Our fifth annual YouTube Ad Blitz in partnership with NBC Sports enables you to replay and vote on your favorite commercials online from a laptop, mobile phone or tablet. 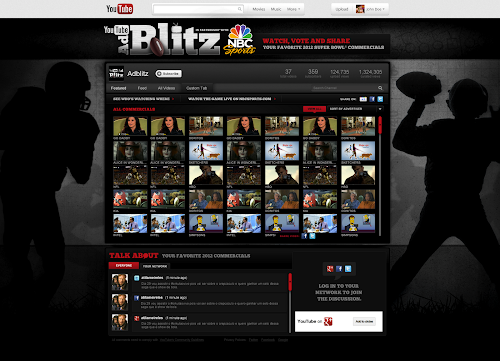 Tune in to the YouTube Ad Blitz channel or NBCSports.com to watch and rate the commercials. Fall means lots of things in the United States: leaves changing colors, apple picking, back to school and…football. This weekend, the National Football League (NFL) starts its season with a bang, with 15 games on Sunday and Monday. College and high school football are already underway and fans all across the country are tuning in, getting excited and rooting for their teams—in person, on television and online. As a Notre Dame alum (class of ‘87), the ups (and the recent downs) of Fighting Irish football are always a big part of my fall weekends. Regardless of your alma mater or hometown team, one thing is certain: American football is a big deal across the United States. Ahead of most of this week’s kickoffs, we thought it would be fun to take a peek at some of the football search trends from around the country. There’s some debate as to what is more popular: professional (NFL) football or college football. Search queries make it clear that in spite of the [nfl lockout], the pro game and [nfl] is consistently more popular for U.S. searchers than all of [college football]. That doesn’t mean that the college game isn’t extraordinarily popular. Right now, we’re seeing the highest level of search queries for [college football] since 2004. In certain regions, college football appears to be king over even the NFL. The states with the most searches for [college football] are mostly in the southern part of the country, with the notable exception of the rabid fans of the Nebraska Cornhuskers. That’s no wonder—on Saturdays, when the Huskers are playing at home, their Memorial Stadium becomes the third largest “city” in the state. We can also conduct a little popularity contest among players in college football. The Heisman Trophy, awarded annually to the top college player, is usually correlated to spikes in search query volume. This year, the early favorites for the Heisman are beginning to take shape. Stanford’s quarterback [andrew luck], who opted to play his senior year in college instead of heading to the pros, is out front in terms of searches, but fans should also watch out for Robert Griffin III from the Baylor Bears program. [rg3], as he’s known, had the game of his career in week one and might be the national breakout star of the first few weeks of the season. Over on the NFL side, it appears that winning the big game has little relation to how often people search for their favorite player. In the past month, the most searched for player in the NFL is [peyton manning] of the Indianapolis Colts, who last won the Super Bowl in 2007. He’s currently sidelined with a neck injury, so his status is likely driving much of the current search queries. Meanwhile, the quarterbacks from the past two Super Bowl winners, [drew brees] from the New Orleans Saints and [aaron rodgers] of the Green Bay Packers, come in behind a player who isn’t even his team’s starter: Denver Broncos QB and former Florida Gators star [tim tebow]. The old saying goes, “on any given Sunday,” meaning that every team has a chance to win each time they hit the field. The adage manifests itself in typically balanced standings that last throughout the season and into the playoffs. But when it comes to search, we’re not quite so fair and balanced. In fact, there’s a clear favorite, and by this measure they really are “America’s Team”: the [dallas cowboys]. In the U.S., the Cowboys lead all other teams in search query volume, followed by the [chicago bears] and the [green bay packers]. No examination of football search trends would be complete without mentioning Fantasy Football. Millions of fans participate in their own drafts and watch their league’s waiver wires as they serve as coach and general manager for their own fantasy team. The enthusiasm is so fevered that, in the U.S. right now, more people are interested in [fantasy football] than President [obama]. Finally, for spectators, football isn’t just about teams and players. It’s also about the game day food. [Tailgating] searches peak every fall as folks turn to the web to discover new recipes and ideas for pre-game parking lot cookouts. The Super Bowl in February really drives gameday recipe searches, but tailgating staples like [guacamole], [wings] and [brats] all rank high in terms of search quantity every fall, with the king of all tailgating recipe-related searches being [dip]. Whether you’re an NFL fan, an NCAA nut or just someone who likes hot wings, here’s to a great season. And go Irish!